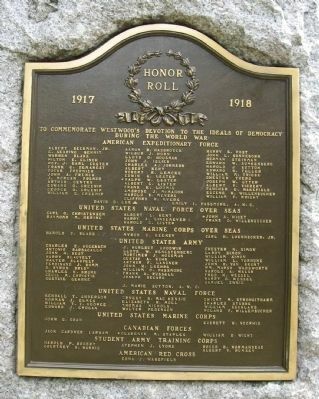 American Expeditionary Force Albert Beckman, Jr. • C. Searing Bennit • Warren Blake • Hilton E. Glinch • Rev J. Earl Custer • Frank C. Demarest • Oscar Fournier • John A. French • J. Morgan French • Arthur Gentry • Edward Q. Greenip • George D. Greenip • William E. Greenip • Aaron R. Hasbrouck • Wilbur J. Horn • Lloyd O. Housman • John J. Islieb • Charles A. Johnson • Albert Kent • Robert R. Lemcke • Edwin A. Lester • * Ralph W. Lester • Albert G. Lister • Frank K. Loomis • Ambrose J. McMahon • Harold B. Meyers • Clifford R. Myers • Harry E. Post • John L. Sonneborn • Herman Steinman • Edward W. Sunkenberg • Harold J. Sutton • Edward H. Teller • William M. Triebe • Chester Tuers • Joseph W. Utter • Albert V. Vickery • Fancher E. Wakefield • Eugene H. Willenbucher • William F. Wright • David D. Lee • Emily I. Passmore, A. N. C.
States Marine Corps Over Seas Harold C. Blake • Myron C. Keeney • Carl H. Loennecker, Jr.
United States Army Charles E. Augsbach • Antonio Barbagallo • John H. Best • Harry Blauvelt • Walter Blauvelt • Ferdinand J. Bomm • D. Myron Brady • Charles H. Bruns • Cecil M. Christie • Gustave Gehrke • J. Hurlbut Goodwin • Lloyd W. Hengstenberg • Motrimer J. Housman • Gustav A. Kuhn • Arthur F. Langner • John H. Luehrs • William O. Passmore • Frank A. Russell • Joseph Segara • Chester N. Simon • LeRoy Simon • William Simon • William L. Terhune • John R. Van Brunt • Wm. Marsh Wadsworth • Harold A. Walsh • Fred H. Wessel • Harry D. Wessel • Samuel Zweig • J. Marie Sutton, A. N. C.
Location. 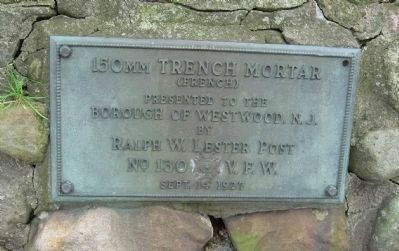 40° 59.464′ N, 74° 1.998′ W. Marker is in Westwood, New Jersey, in Bergen County. Marker is on Madison Avenue, on the right when traveling north. Touch for map. 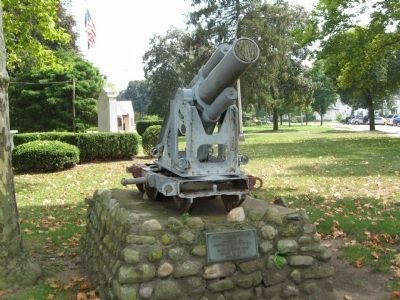 Located in Veterans’ Memorial Park. 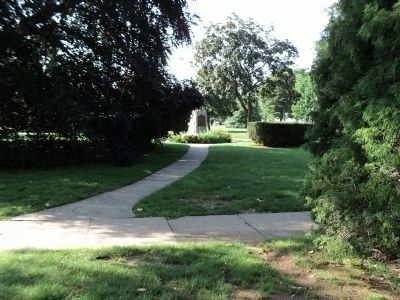 Marker is at or near this postal address: Washington Avenue, Westwood NJ 07675, United States of America. Touch for directions. Other nearby markers. At least 8 other markers are within walking distance of this marker. Sgt. 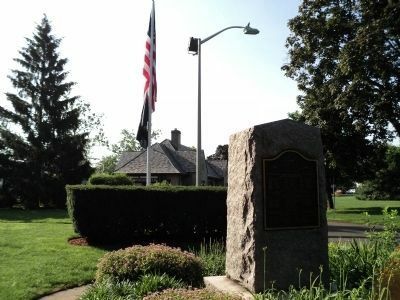 Ralph W. Lester (a few steps from this marker); Westwood Veterans Monument (within shouting distance of this marker); Charles A. Bellon (about 600 feet away, measured in a direct line); Westwood Fire Department Memorial (approx. ¼ mile away); Site of Bogert’s Mill (approx. 0.3 miles away); Hillsdale Police Booth (approx. 0.9 miles away); Henry J. Werner (approx. 0.9 miles away); Hillsdale Fire Department Monument (approx. 0.9 miles away). Touch for a list and map of all markers in Westwood. No. 130 V. F. W.
More. 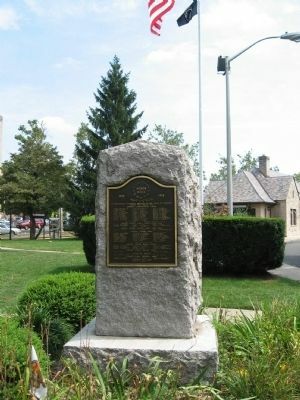 Search the internet for Westwood World War I Monument. Credits. This page was last revised on June 16, 2016. This page originally submitted on August 29, 2009, by Michael Herrick of Southbury, Connecticut. This page has been viewed 1,768 times since then and 14 times this year. Photos: 1, 2. submitted on August 29, 2009, by Michael Herrick of Southbury, Connecticut. 3, 4. submitted on June 29, 2011, by Bill Coughlin of North Arlington, New Jersey. 5, 6. submitted on September 1, 2009, by Michael Herrick of Southbury, Connecticut. • Kevin W. was the editor who published this page.